By Uri Laio, owner of Brassica and Brine. I started beekeeping in the spring of 2011. It began at a rainy Sunday meeting of the (now defunct) Backwards Beekeepers. This was back in the good old days, when it used to actually rain in California and when the Backwards Beekeepers used to meet at FarmLab under the North Spring Street bridge downtown. I distinctly remember the deluge of rain and traversing huge puddles in the parking lot to get to the meeting. I had caught the so-called “bee fever” and I was going to learn to keep bees, one way or another. It is exhilarating to catch the “bee fever,” which is beekeeper lingo for “one who is absolutely determined to keep bees.” It is a mystical calling. To connect to the honeybee is to become inspired, to connect to the ancients. They say humans were enjoying honey wine before we learned to control fire. There were at least a hundred people in attendance at that meeting. At a certain point the floor was opened for questions and announcements from the crowd. A man stood up and spoke softly and briefly about his father who had been a beekeeper, who had passed away recently, and he wanted to donate his equipment to someone who would use it. Divine providence! I approached him and told him I was interested, and we went to his car where I received my first bee box and veil. I set up that box a few weeks later in a friend’s yard in Long Beach. Magically, a colony of bees moved in on their own (yes, you read that right) within two weeks. Divine providence again! God wanted me to be a beekeeper! My bee fever had been vindicated. Since that time, I have been through a lot with my bees. I’ve certainly been stung a lot; I became a bee rescuer and mentor; my bee hives swelled in number, to ten at the peak; my bees have produced what many have told me is the best honey they have ever tasted. You see, my bees only eat honey and pollen. That may sound obvious to the uninitiated, but the truth is that most commercial bee farms supplement their bees’ native food with corn syrup and cane sugar, and sometimes even nastier stuff. So to let the bees eat what is most nourishing for them (honey and pollen) is considered innovative. Also, I don’t treat my bees with poisons, which probably also sounds obvious, but most commercial beekeepers treat their hives with a class of poisons called miticides meant to kill mites, specifically the varroa mite. Some of my most vexing conversations with mainstream beekeepers have been about miticides. The varroa mite is one of the most vicious parasites that attack bees. I have had a mainstream beekeeper (who sells his honey at farmers markets) look me dead in the eye and tell me that a colony of bees can’t survive a varroa infestation more than three months without miticides, while my experience has shown that, despite the fact that I do not and have never used miticides, my colonies have survived for years. I personally feel that the lack of poison and corn syrup in my honey is one of the things that gives it that “best honey ever!” taste. Then there was the time that, for a brief minute, I was even signed on to be the official beekeeper of a rooftop colony of bees over one of the finest restaurants in L.A. — a very bold statement in favor of saving bees on their part. It would have been the first restaurant in L.A. to host honeybees on its roof, a common practice in other cities and other parts of the world (look up Nicolas Geant who keeps bees on top of the Opera Garnier in Paris or Brooklyn Grange Bees in New York City). But our plans were foiled by an overly wary landlord. 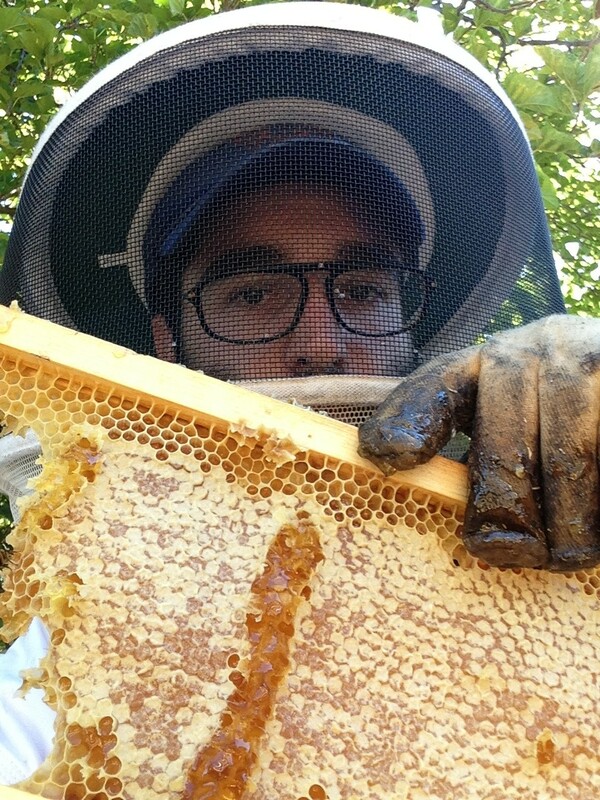 Welcome to L.A.
Beekeeping has been one of the most humbling and edifying experiences of my life. Bees are totally wild—they gather their own food, they conduct their own breeding program. They are brave and selfless, determined from the day they are born until they die to serve the colony. They are architects, chemists, dancers, and geographers, in their own way. This summer has been hard on my colonies. It has been hot and dry, following a hot and dry winter. The weather makes other animals more hungry and desperate, and for some, it skews the cost-and-benefit calculus involved in deciding whether or not to attack a beehive. I lost half my colonies this summer to the Argentine ant. Bet you didn’t know that ants can attack and gut a beehive. Well, they can, and they are very good at it. Beekeeping is a labor of love, that’s for sure, especially in the urban environment. It’s filled with challenges—from simply keeping a hive strong and healthy, to appeasing uninformed neighbors or landlords who may be be (unnecessarily) fearful of honeybees. Fighting off ants and moths and beetles and mites. Sometimes I’ve had to move hives from one site to another. Each hive can weigh hundreds of pounds and be filled with tens of thousands of bees. But I couldn’t be happier that I caught the bee fever those years ago. I know that the wisdom I’ve learned from the bees will be with me for the rest of my life.